O you who have believed, fulfill [all] contracts. Lawful for you are the animals of grazing livestock except for that which is recited to you [in this Qur’an] – hunting not being permitted while you are in the state of ihram. Indeed, Allah ordains what He intends. Translation: [Fasting for] a limited number of days. So whoever among you is ill or on a journey [during them] – then an equal number of days [are to be made up]. And upon those who are able [to fast, but with hardship] – a ransom [as substitute] of feeding a poor person [each day]. And whoever volunteers excess – it is better for him. But to fast is best for you, if you only knew. Translation: The month of Ramadhan [is that] in which was revealed the Qur’an, a guidance for the people and clear proofs of guidance and criterion. So whoever sights [the new moon of] the month, let him fast it; and whoever is ill or on a journey – then an equal number of other days. 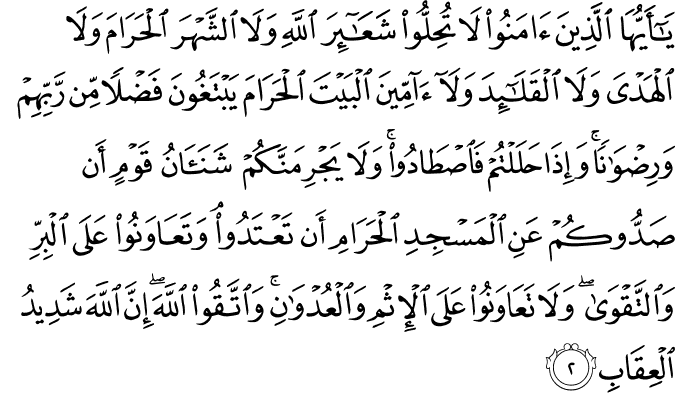 Allah intends for you ease and does not intend for you hardship and [wants] for you to complete the period and to glorify Allah for that [to] which He has guided you; and perhaps you will be grateful. 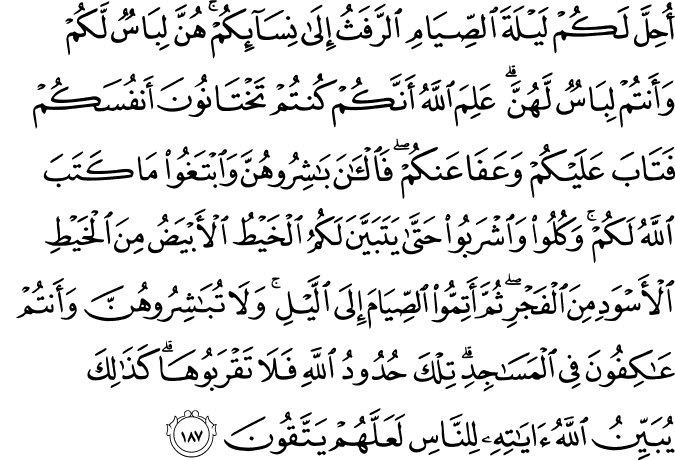 Translation: And when My servants ask you, [O Muhammad], concerning Me – indeed I am near. I respond to the invocation of the supplicant when he calls upon Me. 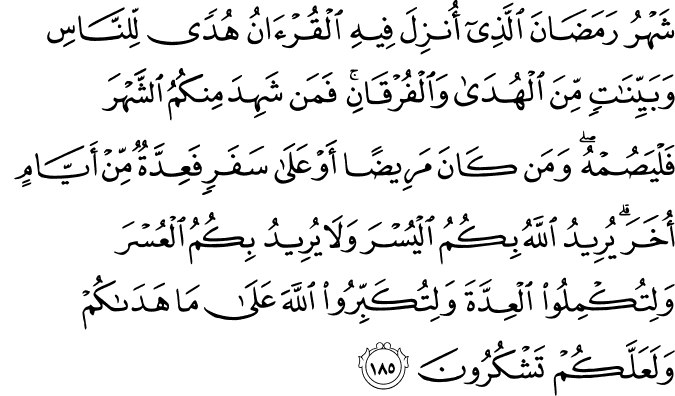 So let them respond to Me [by obedience] and believe in Me that they may be [rightly] guided. Translation: It has been made permissible for you the night preceding fasting to go to your wives [for sexual relations]. They are clothing for you and you are clothing for them. Allah knows that you used to deceive yourselves, so He accepted your repentance and forgave you. So now, have relations with them and seek that which Allah has decreed for you. And eat and drink until the white thread of dawn becomes distinct to you from the black thread [of night]. Then complete the fast until the sunset. And do not have relations with them as long as you are staying for worship in the mosques. These are the limits [set by] Allah , so do not approach them. 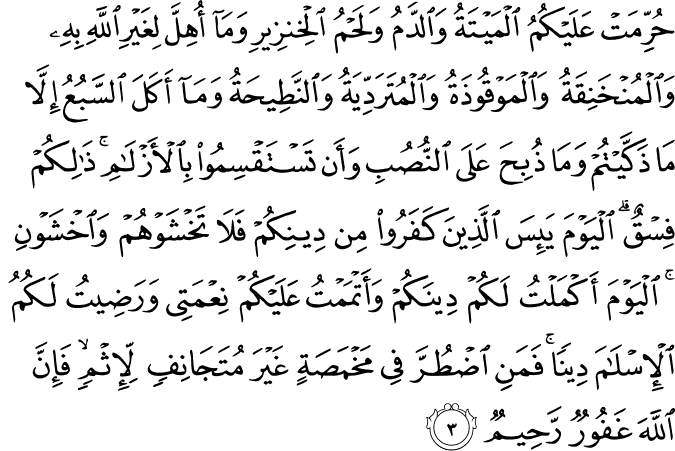 Thus does Allah make clear His ordinances to the people that they may become righteous. Sahih International And [He revealed] that the masjids are for Allah , so do not invoke with Allah anyone.